The Wii Balance Board could end up saving lives someday, or at least helping out a bit. Nintendo Wii controllers are finding many a use other than wild arm-flailing fun and embarrassing television destruction. Wii Remotes have already been hacked for science, and now the Wii Balance Board has been tested to be as "clinically capable" as an $18,000 piece of medical equipment. University of Melbourne researcher Dr. Ross Clark heard about Wii Remotes being used in the scientific field and got to wondering if the Wii Balance Board could have a similar use. "I wanted to know if it would be any good for assessing the standing balance of patients," he told New Scientist. Up until now, $18,000 "force platforms" have been used to help patients relearn how to balance themselves after traumatic injuries or illnesses such as strokes. This cost puts them out of reach for many clinics. 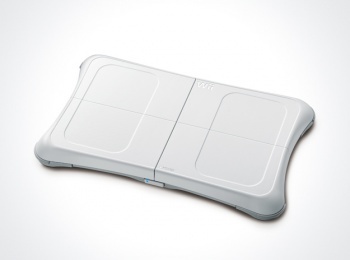 Enter, the Wii Balance Board. Clark and fellow researchers were able to get their hands on one and hacked it apart for science. He relates: "We found the data to be excellent. I was shocked given the price: it was an extremely impressive strain gauge set-up." Clark eventually published a paper where he and his colleagues determined that the Wii Balance Board sometimes exceeded the performance of a force platform, at roughly 1/200 of the cost. This means it "could provide the average clinician with a standing balance assessment tool suitable for the clinical setting." Clark continues: "The low price of the Wii kit is now seeing it used to assess rehabilitation after stroke, traumatic brain injuries and to examine standing balance in children who were born pre-term." Amazingly, Nintendo accessories are helping scientific and medical communities all over. The next thing we know, we'll see the Wii Vitality Sensor used to measure people's vital signs. Wouldn't that be a sight.